A pill box case that makes taking pills easier. Vivid colors help everyone especially seniors distinguish days of the week, offering independence. With the Thassio set you get a complete set to take care of your prescription needs. Easily organize weekly medication in the daily compartments. Medicine can be divided in AM/PM with compartments for Morning, Afternoon, Evening and Night. Getting the perfect dose of medication is important and prescriptions often call for half doses. Our pill cutter makes cutting pill easy and safe. Just load the pill in the splitter push down on the lid and you're set. 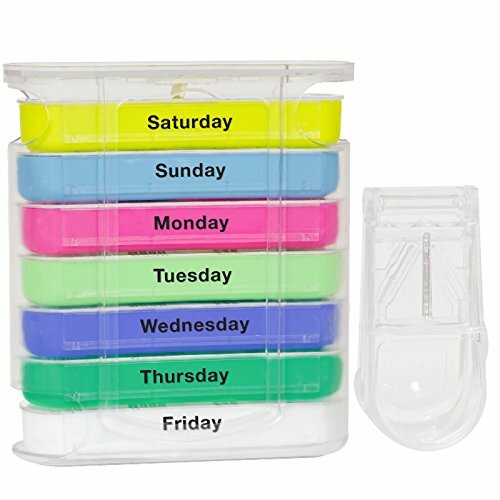 If you're going out for the day or on a vacation this pill case is great for travel. For a day trip place the compartment in your purse and you're in good health. The case easily fits in your luggage and protects your medication in transit. Backed by a 100% No-Hassle, RISK FREE Money Back Guarantee! If you are not completely satisfied with our pill organizer, we will give you a full refund. No questions asked! Click the Add to Cart Button at the top of this Page to organize your medication today! View More In Medication Aids. If you have any questions about this product by Thassio, contact us by completing and submitting the form below. If you are looking for a specif part number, please include it with your message.